Hall of Fame coach Al Arbour will return to Long Island to coach his 1,500th regular season game with the Islanders on Saturday, November 3 when the team hosts Sidney Crosby and the Pittsburgh Penguins at the Nassau Coliseum at 7:00 pm. The legendary coach celebrates his 75th birthday on November 1. Earlier this week Arbour accepted an invitation from Ted Nolan to run the team for one last game and reach the milestone of 1,500 games coached with the franchise he led to four consecutive Stanley Cups from 1980 - 1983. Arbour will sign a one-day contract on Friday, November 2 and lead the team the following night against the Penguins. "This is an incredible gesture by Ted and the Islanders," Arbour said this morning from his summer home in Ontario. "I am flattered that Ted thought of me and I wouldn't miss this night for the world. I told the team that I do not want any pre-game fanfare. I'm there to coach the game and help Ted and my Islanders try to earn two points against a very tough team." Nolan explains why he extended the invitation to Arbour: "Every day last season I would walk by that big board outside our locker room at the Coliseum that lists the franchise's award winners and milestones," said Nolan. "And every day it would kill me when I'd see Coach Arbour made it to 1,499 games. "I asked (GM) Garth Snow if we could bring Coach back for one more game and to ask the NHL office to recognize it. They did, Coach Arbour emphatically said he was on board and now I can't wait. It's going to be an amazing night, I can guarantee you that. 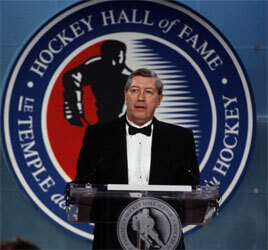 To me, Al Arbour and Scotty Bowman are the two greatest coaches in NHL history." Arbour's games coached and victories with the franchise are the most by any coach with one team in NHL history. His regular season record with the Islanders over 1,499 games is 739-537-223. In the playoffs, Arbour had a 119-79 record with the Islanders. He is the second all-time winningest coach in NHL history with 781 career victories, behind only Scotty Bowman. "Ted Nolan has shown a great deal of respect for the tradition and history of the New York Islanders and Al Arbour by stepping aside and having Al coach his 1500th game," said Mike Bossy, Arbour's Hall of Fame right wing from the dynasty era. "As a former player of Al's I am looking forward to seeing him adjust his glasses and brush his hair aside one more time. 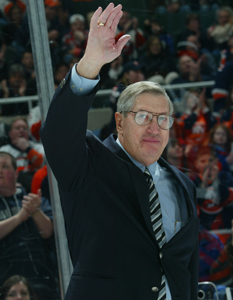 "Al Arbour put his stamp on what the New York Islanders are all about – heart, grit and character. It's perfect that he'll be sharing the bench with a man in Ted who believes in the same philosophy. Anyone who's close to Al knows he's taking this very seriously and won't allow himself to soak it all in and enjoy the fan support until the game is over. He's probably already breaking down Pittsburgh game tape."